Why Use Rhino Load Decks? Rhino Deck was designed to fit the needs of the construction market, providing a safety system that could be used inside buildings during construction to provide a means of access, as well as an effective load and work platform. Rapid installation – The Rhino Load Deck saves time and money in erection and dismantling of the system. A three-in-one solution – for access, loading, and working – thereby dramatically improving productivity. Rhino Load Deck support up to 600kg at 3ms. Rhino Load Deck does not need standing wall support. 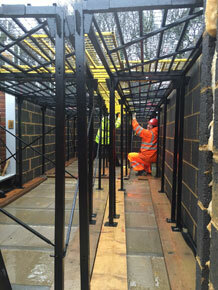 A total safe working height of 4m’s can be designed by our specialist team.